Marine Environment Forum – Some members of the Green School Committee attended a forum on the Marine Environment at the Mt Errigal hotel on November 8th. 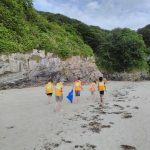 We worked in a group with other schools discussing ways in which we as schools can increase awareness of problems associated with the Marine Environment. 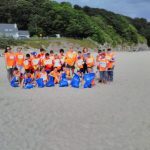 Here at Scoil Cholmcille we have have already engaged in many of the ideas raised on the day, such as being a Clean Coasts school and the Think Before You Flush campaign. Our application for the flag is now complete and we have sent it to Dublin for head office to assess. 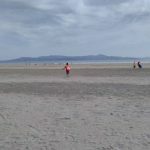 Beach Visit with Aengus Kennedy – We had a wonderful day at the beach with Aengus from Nature North West last month. 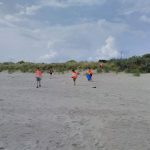 We learned about the various tidal zones at Marble Hill beach. 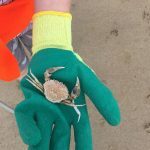 We collected and identified various sea creatures from the rock pools at low tide and examined how marram grass acts as a natural guard against erosion at the beach. 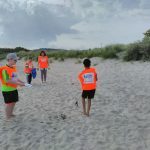 We also conducted a water quality test on the stream that runs onto the beach. 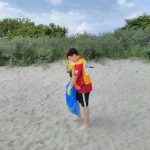 Tip – swim in the sea, not the stream!! Some of the pupils wrote about the trip, these can be viewed on the Green Schools Notice Board. We are in the process of ordering identification cards for various habitats which classes may use when on trips. REEL Life Science Competition – We entered our production ‘Something Fishy” into this national competition recently and were unfortunate not to make the shortlist of winners. Well done to everyone involved. Battery Recycling – We have seen a surge in the number of batteries being recycled this week – keep up the good work. Bird Feeding – There are loads of berries around the school grounds so we have suspended putting out bird feed unti.l the weather gets colder. 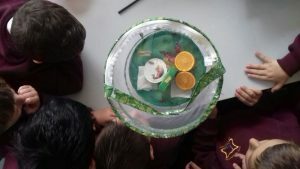 Composting – Well done and thanks to the boys from 6th class who continue to compost on behalf of the staff each day. Recording of Electricity Units – The units of electricity consumed by the school continue to be recorded on a daily basis. Any class wishing to plot these on a graph please contact a member of the committee. New Committee – This was formed at our first meeting on Thursday September 6th. 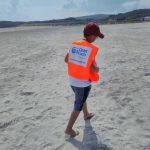 The members are: Pauric Kerr, Mario Kahanec,,Aodhan Dempsey,Cristofer Manti, Jack Devlin, Shayne Wilkie Calonne, Conor O’Donnell – McGinchey, Michelle Adeyda Monares, Wilhermina Amponsah, Khorsid Mohibi, Odhran Keys, Anthonee Banlawe, Sebastian Wontorek, Darragh Dunleavy, Mujtaba Ahmed, Flourish iyahen, TJ Lunney, Darragh Eckberg-Timoney, Nosa Smith, Levin Laibu, Caolain Donnelly, Patryk Ziarko, Stephen Hegarty. 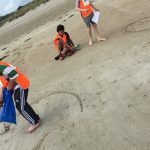 Green Flag Review – We had our review for our flag for Global Citizenship – Marine Environment on Monday September 10th with Mrs Suzanne Bogan. 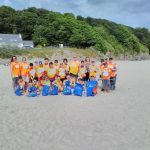 Suzanne was particularly impressed with the enthusiasm and passion the children have for the Marine Environment. She really enjoyed the Something Fishy video and commended the boys on their superb acting skills. We will now submit our application electronically to head office and await confirmation that we have succeeded in obtaining our 10th green flag. Marine Litter Awareness Survey – These have been distributed to the classes from 1st upwards. Please complete the survey as soon as possible with your class and return to Ms O’Sullivan as the results form part of our application. New Green Schools Area – There is a new display corner in Room 8. We have a bird’s nest on show which Peter found abandoned in the school grounds, complete with eggs. You may look but please do not touch! There are also some booklets on various topics which you may remove and use with your classes. 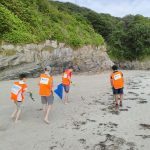 River and Beach Trip – On October 8th we shall be undertaking another visit to the coast as part of our Green Flag work. 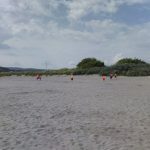 We will be visiting a local river to check its level of water quality as part of a day trip to Marble Hill beach where we will study the tidal zones with Aenghus Kennedy of Nature North West. We are in the process of applying for a grant for this trip and are hoping there will be some money left over for ice cream and that the sun will shine on the day! 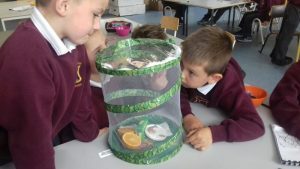 Junior infants have watched the butterfly cycle at first hand. 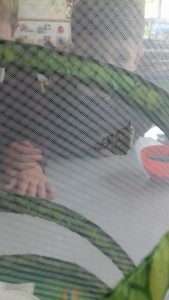 They watched the baby caterpillars grow bigger and then progress to the pupa stage. Now they are watching them transform into Red Admiral butterflies. 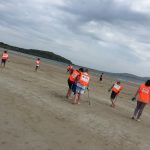 Clean Coasts Beach Clean – The committee went to Marble Hill beach on Thursday June 7th to meet with Beckey-Finn Britton to participate in the Coca Cola Clean Coats Week beach Clean. 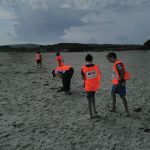 We cleared the beach of lots of very small items which would be harmful to marine life. 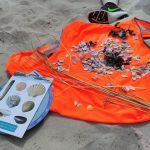 These items included plasters, baby wipes, bits of string, old broken tennis balls and small pieces of plastic. 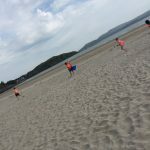 We played some games on the beach and had a picnic as well. It was a very enjoyable day. 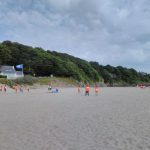 Walk on Wednesday – We have had some wonderful weather for walking to school on Wednesdays recently and this has been reflected in the increasing numbers for each class. Well done to Ms McNulty’s class who are regular winners of the Golden Boot and to the Junior Infant classes who have made their mark also. 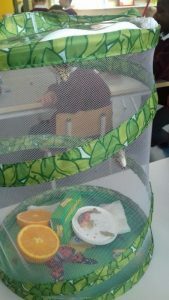 Butterflies in Junior Infants – Pop into Junior Infants today to see the butterflies emerge from their pupas. We have been monitoring them since they were baby caterpillars a few short weeks ago. We are amazed to see the colour come into their wings in the space of a few hours. 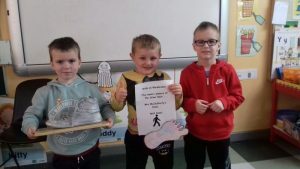 Schools Garden Competition – Letterkenny Tidy Towns – We submitted our entry for this competition last Friday and wait in hope for a good result. Our grounds are looking so pretty and a special thanks to Mrs Emery for the beautiful display of colour at the front door. Committee Meeting – The final committee meeting of the year will take place in Ms O’Sullivan’s room on Thursday June 14th at 2:15pm. 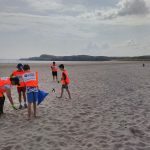 We participated in the clean coasts clean up with Beckey-Finn Britton. 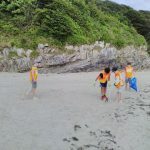 We discussed how long rubbish items take to decompose in the sea and played some games on the beach. Last week’s winners were Mrs. Mc Clafferty’s Junior infants. 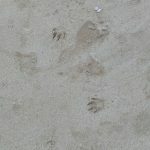 Walk on Wednesday – This annual initiative has begun in earnest. Well done to everyone making a special effort to walk some or all of the way to school each Wednesday (and any other day!) May the good weather continue! 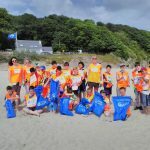 Local Authority Waters and Communities Office – We are very excited about the upcoming visit by Jimmy McVeigh from the LAWCO office to facilitate workshops on Rivers in our Community with several classes from the junior end of the school. More information to follow closer to the day, which will take place on May 30th. 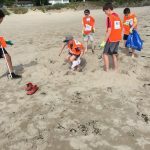 Spring Clean 2018 – This annual event will take place in the school grounds later in the month. We will be incorporating it with the #2minutestreet clean initiative with which we are working towards our Green Flag this year. 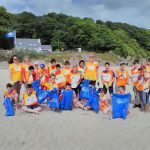 Schools Competition – The annual Letterkenny Tidy Towns schools competition is open now. More information may be sought from Mr McGowan. On the same note, should anyone take any photos of the pupils out in the school grounds that we may use for the competition please send to Ms O’Sullivan. Marine Environment – A gentle reminder to all classes to please send any projects / curriculum work on this topic to Ms O’Sullivan please. Green Schools Committee Meeting – The May meeting will take place in Ms O’Sullivan’s room on Tuesday May 1st at 2:15pm. 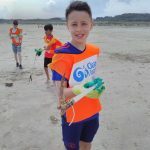 Cleaner Community Awards – Some members of the Green Schools Committee attended the Tidy Towns Cleaner Community Campaign launch with TV celebrity Duncan Stewart at An Grianan Theatre on Tuesday April 10th. 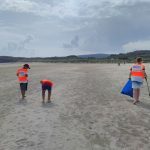 We are always delighted to be a part of this campaign and to work with the local community groups to help make Letterkenny beautiful. Walk on Wednesday – It’s that time of year again folks – blow off the cobwebs on Wednesdays and start walking some or all of the way to school. Committee members will circulate all classes to check numbers of walkers each walk. As always, the senior classes will compete for the Golden Boot and the junior classes will walk their way to winning the Silver Boot each week. 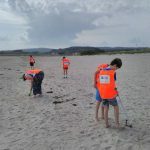 Marine Environment Projects – Could all classes p[lease submit their work on the various topics, Marine Litter, Plastic Islands, The Great Pacific Garbage Patch, Think Before Youi Flush Campaign etc, before June please. Local Authority Waters and Communities Officer , will be conducting a workshop on rivers. 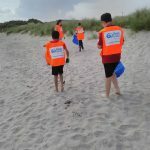 In June the Green Schools Committee will take part in the Coca Cola Clean Coasts Week at Marble Hill Beach. Junior Infants will attend a special Infants Day at Glenveagh National Park to round off the activities for the year. 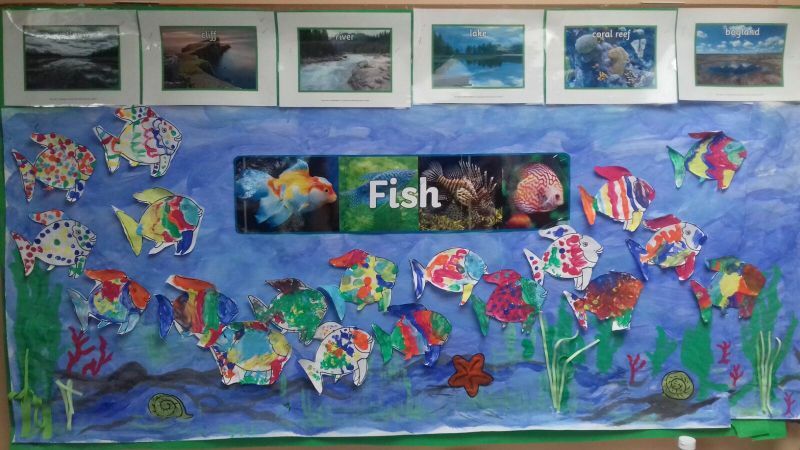 Ms. O’ Sullivan’s infants have been busy learning about fish prior to inland fisheries visit to the school later this week. Meeting – We shall have our March meeting on Wednesday March 7th at 2:15pm in Room 2. All members of the Green Schools Committee are required to be there. Something Fishy – Filming is complete and we are awaiting the completed film back from the cameraman. Huge thanks to Michael Tinney, father of Dylan in Senior Infants for doing this for us. The Inland Fisheries team are due back to the school within the next fortnight for the second river workshop with Mr Kavanagh’s class. 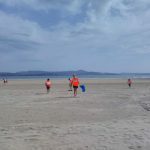 Workshops – We have been in touch with Becky-Finn Britton from An Taisce and Jimmy McVeigh from the Local Water and Communities Office regarding upcoming workshops and field trips next May and June. Spring Flowers in Bloom – We are delighted to see the first signs of Spring in our school grounds. Please take time to see the bright crocuses by the side door and the host of golden daffodils as planted by the Junior Infants at the front door. The buds are also appearing on the trees – Spring is in the air! Battery recycling – We have filled almost 3 boxes since Christmas – keep bring in your old batteries for recycling. WEEE Ireland will call and collect the boxes when we have a minimum of 5 filled. Meeting – We had our February meeting on Monday 5th and was attended by all of the Green Schools Committee. We discussed the various roles the committee members undertake and how we were progressing with all aspects of the Green Schools Programme. Something Fishy – We are currently rehearsing for a short sketch for our project in association with Inland Fisheries Ireland. We hope to complete filming on Monday and will host the world premier showing in the hall soon after. Waste Water Treatment Plant – Mr McGowan’s class visited the plant recently. Their experience of the treatment plant and photographs will be available shortly. Bulb Planting – Lots of bulbs have been planted at the entrance to the school, we look forward to seeing daffodils and tulips in full bloom in a few months. Some classes planted bulbs in planters in their classrooms, don’t forget to water them! 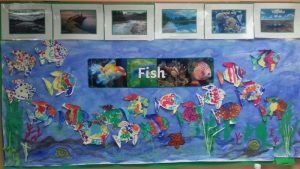 Something Fishy –Something Fishy visited Mr Kavanagh’s class on November 28th . This was an introductory visit as part of the schools fisheries programme and will return in a couple of months to see how we are getting on with our project. 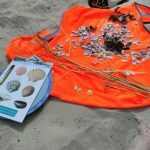 See their website on www.somethinghfishy.ie for ideas on lessons for your class. Waste Water Treatment – 4th class are studying the Water Cycle and will visit the local waste water treatment centre in the new year as part of our application for the green flag in Global Citizenship, Marine Environment. 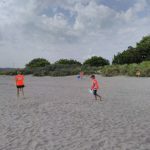 Sea Safari / Cleaner Coasts – We have registered as a Cleaner Coasts group for Marble Hill beach. 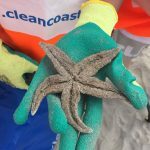 Our liaison officer is Becky-Finn Britton and we shall be meeting her in the new year in regards to both the Cleaner Coasts programme and the Sea Safari. Committee Meeting – The next Green Schools Meeting will be in Ms O’Sullivan’s room on Monday 18th December at 2:15pm. Wishing everybody a healthy and happy Christmas! 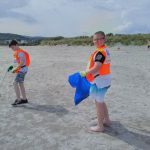 Letterkenny Tidy Towns Awards – Scoil Cholmcille was awarded a “Caring for the Environment” award and an award for “School Gardener’s of the Year” at the recent awards ceremony at the Mount Errigal Hotel on Monday night. Mr Cannon and Konrad Krol accepted the awards on behalf of the school. Bulb Planting – We shall be planting lots of bulbs over the next few days and look forward to seeing daffodils and tulips in full bloom in a few months. Weee Ireland battery collection – Mykola from Weee Ireland collected 5 boxes of batteries just before Halloween. 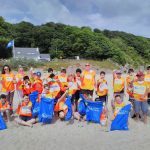 Something Fishy –Something Fishy is an Educational Programme, aimed at Primary school pupils aged between 10-13 years, which informs and educates students on fish, water, angling, and the environment and angling. Mr Kavanagh’s 5th / 6th class will participate in a workshop delivered by Owen Kelly of Inland Fisheries Ireland on November 28th. 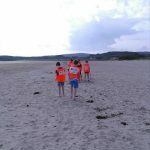 See their website on www.somethinghfishy.ie for ideas on lessons for your class. 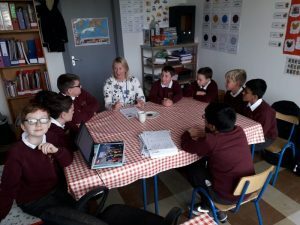 Waste Water Treatment – 4th class are studying the Water Cycle and will visit the local waste water treatment centre as part of our application for the green flag in Global Citizenship, Marine Environment. 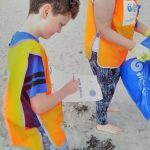 Marine Litter Awareness Survey – We are in the midst of compiling the results from this survey and will put them on the school notice board. 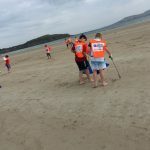 Coastal Programmes Development Officer – Donegal & Leitrim with regards to our visit to Marble Hill beach next year. Committee Meeting – The next Green Schools Meeting will be in Ms O’Sullivan’s room on Thursday 9th November at 2:15pm. Tree Day – was on October 5th. Mrs Kenny and Mrs O’Connor’s classes planted alder trees to celebrate this national day. Check out their photographs on the school website! 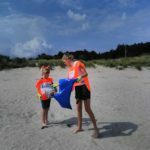 Green Flag – We are working on our Green Flag for Global Citizenship – Marine Environment. 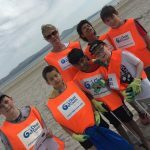 Please check out the following links with your class and get back to the Green School’s Committee about any work you do in relation to this very important and interesting topic. 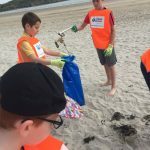 On the resources section of the Green School’s website you will find fact sheets on all sorts of creatures, info (inc a video) on plastic islands , a curriculum link template, an action plan template, a rocky shore activity, a guide to making green cleaning products, a guide to marine litter, info on cloth nappies etc. 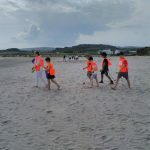 There’s a great presentation of the work that a school did on the subject of Plastic Islands up there, that will provide you with loads of info and ideas https://greenschoolsireland.org/wp-content/uploads/2017/06/Plastic-Islands-presentation-St-Clares-Harolds-cross.pdf. This is a great video that explains about what happens to plastic bottles after we use them. We may think they all get recycled into something else, some do, but many don’t – see video for explanation https://www.youtube.com/watch?v=_6xlNyWPpB8. Perhaps you could the students to pledge to reduce the number of plastic bottles they buy, or say no to plastic straws. 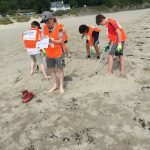 Survey – Each class has received a Marine Litter Awareness Survey, please return results to Ms O’Sullivan as soon as possible. We will conduct this survey again towards the end of our two year programme. Battery Recycling – We have filled more than 5 boxes and these will be collected by a representative from Weee Ireland soon. Committee Meeting – We shall have our next meeting on Wednesday 18th October at 2:15pm in Ms O’Sullivan’s room. 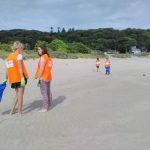 Welcome back to the new school year as we begin work on our new flag – Global Citizenship, Marine Environment. Jayden, Ryan, Kaoi, Fela, Adam, Sean, Jack, Evan, Ariz, Aaron, Luke, Sebastian, Andrei, Michael, Danny, Dillon, Konrad, finn, Kevin, Odhran, Sean and Ashton. 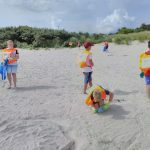 Two boys were chosen from each class (1st – 6th) based on their interest in joining Green Schools and their commitment to working on the Global Citizenship – Marine Environment programme during the school year. Here at Scoil Cholmcille we have a whole school attitude to Green Schools. All classes are involved in various aspects of the programme. Finn and Konrad will be monitoring electricity usage this year. They will record the number of units used in the school twice a week – Monday morning and Friday afternoon. Sean and Ashton will be taking the minutes of the meetings this year. Odhran and Kevin will be removing all items for compost from the staff room after 1:30pm. Michael, Danny and Dillon will be on litter patrol in the school grounds after lunch break finioshes at 1pm. Aaron and Luke will be looking after the recycling of cards this year, the box will be held in Mrs Kenny’s room. Evan and Ariz will help you with the recycling of your batteries this year. Boxes for your batteries can be found in Mrs O’Connor’s room and in Room 2. Adam, Sean, Jack and Mrs Mulrain’s class will keep the birds fed this winter. Remember to feed the birds at home also. The new committee had their first meeting last week as they sat in the lovely autumn sunshine and discussed the roles and responsibilities for the coming year. Please send any photographs / environmental work being done to Room 2 for inclusion in our work for the flag. Tree Day is on October 5th. Please go to the Tree Council’s website for ideas on school activities related to this annual celebration of trees. 3rd class will plant a mighty Oak tree on the day to mark the occasion.